BERLIN, Germany, 2017-Mar-30 — /Travel PR News/ — Rail technology leader Bombardier Transportation announced today the arrival of the first TEG-15 model light rail vehicle (LRV) in the city of Guadalajara, Mexico. 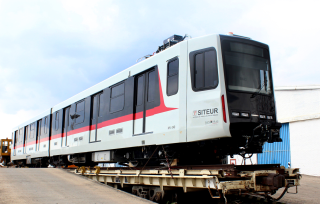 The vehicle is from an order placed on December 29, 2015 by the Sistema de Tren Eléctrico Urbano (SITEUR) for Bombardier to supply 12, two-car LRVs. The train will run on SITEUR’s Line 1 as part of the Jalisco government’s plan to extend and modernize the line. The last train is scheduled to be delivered by the end of November 2017. The new vehicles will have a range of features that will improve the travel experience for Guadalajara public transit system’s passengers and drivers. Among them are an On-Board Video Recording System (OVRS), a passenger communication intercom, a new fire and smoke detection system, Light Emitting Diode (LED) technology, visual alerts for closing doors, as well as wheelchair access. Additionally, the drivers’ cabin, equipment, and controls have all been redesigned for greater ergonomics. The 29.56 metre-long, articulated carbon steel vehicles will also have high reliability and lower maintenance costs while increasing transport capacity with ample space for up to 48 seated passengers, and over 250 standing passengers per vehicle. The vehicles will have a maximum speed of 80 kilometres per hour and be fully compatible with the Bombardier-built TEG-90 version previously delivered to SITEUR. The TEG-15 LRV is part of Bombardier successful Mexican Legacy Light Rail Vehicles developed since the 90s with more than 100 trains in service in Mexico’s three largest cities: Guadalajara, Monterrey and Mexico City. From design and manufacturing to commissioning and warranty, the project is being managed by teams working out of Bombardier Transportation’s Ciudad Sahagún facility in the State of Hidalgo. The first vehicle will continue testing at SITEUR’s facilities, with a provisional acceptance anticipated no later than the second half of May 2017. Established in Mexico for 25 years, Bombardier Transportation has developed a strong and successful local manufacturing footprint in the Mexican rail industry, employing around 1,800 people. It specializes in manufacturing, the introduction of passenger rail vehicles, maintenance and after-sales service. The company offers the Mexican market a complete range of systems, products and rail passenger services such as, metro cars, light rail, locomotives and regional trains. To date, Bombardier has supplied around 70% of the rolling stock currently in operation in Mexico from its local facilities, a demonstration of Bombardier’s long term commitment to the Mexican market. This entry was posted in Trains, Transportation, Travel and tagged Benoit Brossoit, Bombardier Transportation, Guadalajara, Mexico, SITEUR, TEG-15 train. Bookmark the permalink.